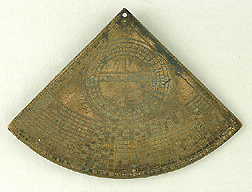 This undated instrument belongs to a group of three very similar horary quadrants, two of which are dated 1398 and 1399 (Epact 17546) respectively. The date of this quadrant is derived from the underlying values for the Easter table and the list of solar altitudes. There can be little doubt that all three instruments were made in England. The quadrant was on display during the Wartime exhibition in the British Museum in 1940 and shows obvious signs of fire damage. It consists of a table of solar altitudes, an Easter table, an equal hour scale as well as a shadow scale.